The Boboli Gardens, Florence at its best. The top thing about living in Oltrarno is the fact that you can enjoy the Boboli Gardens whenever you want. 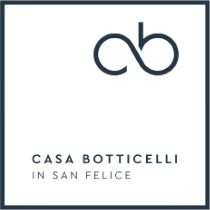 Book a room at Casa Botticelli boutique hotel and get the possibility of watching the Pitti Palace from your windows while enjoying the scents and the atmosphere of this fascinating park. The Boboli Gardens found their origins with Eleonora di Toledo, Cosimo I's wife, who managed to live with her kids immersed in the pure nature, far from the unhealthy climate that had been created in the center of the city. The history of this enchanting place could be told with a thousand and more stories describing sculptures, fountains, fantastic animals and curious facts. The arrangement of the green area was entrusted by the Medici to the Tribolo, but it was Bartolomeo Ammannati to conclude the work. One of the first and most impressive buildings that you will find is the amphitheater, inaugurated in 1637, surmounted by an ancient Egyptian obelisk, set in this location by the Grand Duke Pietro Leopoldo together with a large granite tub from the Roman era. Walking through the tree-lined avenues you can experience the bucolic air represented by the vineyards that border one side, while you can travel in time admiring the Fort Belvedere and the walls that once protected the Capital. The Fountain of Neptune (or “the fork’s” one) is astonishing, like the Roman statues from the Trajan forum, or the famous “grotto” made by Buontalenti. Inside the Casino del Cavaliere, the reigns' entertainment venue, you will find the splendid Porcelain Museum, while from the Kaffeehaus you can admire a breathtaking panoramic view of Florence. But this seductive spot is not only an open-air museum: there are numerous fragrant and rare plants, mixed with box hedges and centuries-old trees. The Boboli Gardens has been the source of inspiration for numerous green areas of international realms, such as that of Versailles, for example, and it is one of the favorite parks by the Florentines, especially for the inhabitants of the Santo Spirito’s district. This garden is the perfect destination for a relaxing afternoon while you enjoy your holidays in Tuscany. After a visit to this corner of Heaven, you can only decide to celebrate your journey with an aperitif and a romantic dinner: read the rest of the pages and plan your perfect day in Florence!